Southampton made the long journey north to Manchester knowing that even with a defeat they’d remain out of the relegation zone. Still, the pain that van Persie’s late winner caused earlier in the season lingers and fresh with a new manager, they’d fancy their chances of getting a result. United already knew they had a chance to widen the gap to City after seeing them draw at QPR on Tuesday. As ever, we welcome comments from both sets of fans. Pochettino and his side must take great credit for the way his team performed, not only in the second half, but throughout the game. Not only did Southampton enjoy space and attacking joy in the final third (a worrying trend that continues for United), but the away side were tight on the pressing side of their game, each player perfectly drilled in their role, and crucially they worked hard to tame United’s key threats. Schneiderlin sat just in front of the back four, effectively nullifying Rooney’s role (whose two goals disguised a slack performance) and also shadowing van Persie’s deep forays. Carrick and Anderson were hassled immediately when in possession, and Vidic and Smalling weren’t given any time at all on the ball in defence. Further ahead, Ramirez, Puncheon and later, Lallana were instructed to push fullbacks Evra and Jones back – and it was perhaps this strategy alone that ensured that Southampton appeared to have the freedom of Old Trafford, in the second half in particular. This season, Rafael and Evra have been particularly efficient in timing their attacking jaunts upfield, with most of United’s good work emanating from the two fullbacks; tonight, Pochettino pinned Jones and Evra back superbly, instructing Clyne and Fox to assist the wide men whenever possible with attacking intent. In fact, to lavish further praise on them, at times the formation often resembled that of Barcelona, with both centre halves Yoshida and Hooiveld very far apart (hugging the touchline), the fullbacks very high, and Schneiderlin having to drop into the defence. 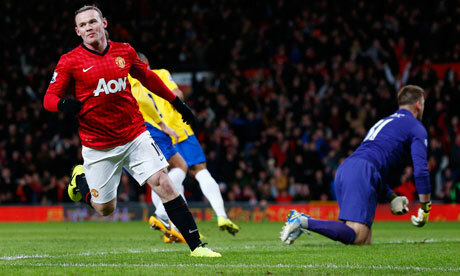 United crept deeper into their own half as the game wore on, and were unable to find any kind of rhythm to their game. Much like the game at the start of the season, Saints went home incredibly unlucky and could quite easily have taken a point from the game. With United suffering both in and out of possession – Welbeck, Anderson and Rooney being particularly wasteful with the ball – Fergie was noticeably agitated. The only surprise was that there was no half time substitutions! On the hour mark, Ferdinand was called upon to replace Smalling, who wasn’t awful, but was finding the high press hard to deal with, causing havoc with his positional play and meaning both he and Vidic were far too deep. The idea was to provide more assured possession too, and use Ferdinand’s experience to try and halt the wave of attacks (this didn’t exactly happen in this way!). Anderson was next to be culled, for Rafael, who promptly went to right back and Jones paired up with Carrick in the centre. Anderson deserved his place in the eleven (with Cleverley rested), but he was naive in his positioning all night. He started just ahead of Carrick positionally, but where he might have exceeded was in response to the away team’s tactics. The Brazilian remained very high, too close to Rooney (whose wandering didn’t help, admittedly) and rarely retreated to aid Carrick in front of the back four. That said, Jones’ output in the centre was not much of an improvement, as he too struggled to retreat from forays forward, with his close control under pressure notoriously tetchy. Finally, Nani replaced Kagawa. The Japanese star performed admirably again coming in from the left (and later in the game from the right as he interchanged with Welbeck), but with Southampton pressing high on the wings, Kagawa was struggling with defensive duties so deep. Always neat in possession, and credited with a superb, deft, assist as United drew level, the change was purely tactical; Nani’s energy on the counter was useful in theory, and he used his pace well to assist Rafael late on in defensive zones. In the last 10 minutes, Ferguson finally switched Welbeck and Rooney, the latter assisting Evra on the left side, with Welbeck’s pace and presence in the centre stifling the creative duties of Schneiderlin and Cork. With the game over and won it almost seems pointless trying to decipher who’s most to blame for the goal United conceded. Anderson for being slack and allowing an all too easy pass? Carrick for under-hitting his pass-back? Or de Gea for not being first to the ball? 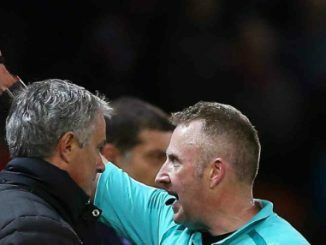 Naturally, the press put the blame on de Gea – apparently slow off his line and a bit too soft going into the challenge. Indeed he must shoulder plenty of the blame and did certainly pull out of attempting a tackle to win the ball from Rodriguez but what was the alternative? In fact he was quick off his line but Rodriguez was quicker and always getting to the ball first – if de Gea makes the challenge, then the odds seem firmly in favour of him missing, bringing Rodriguez down, getting sent off, and conceding a penalty. Whether under instruction from above to take pressure off de Gea or just annoyed with a rare error, Carrick rightly took the full blame after the game. He left his pass short – it wasn’t even one on the ground that de Gea could have slid in for but at an awkward height – not quite high enough to go with hands but too high for a ground tackle. It set the tone for one of Carrick’s poorer games of the season (not aided by Anderson as noted earlier). Anderson himself was lazy in performing his defensive duties and it was his reluctance to get close to his Southampton counterpart that enabled the move for the goal to even take place. The press culture of blaming de Gea is becoming ridiculous but all too predictable. Today, headlines were about his error even though United won. The incredulous thing is that this is the day after two other high profile goalkeepers both contributed to their sides not winning a game and yet they’ve gotten off without the headlines. Vidic, the subject of some extensive analysis by Neville for his ‘stare’ at de Gea was very supportive of David post-match and assured viewers that the goalkeeper is most definitely United’s best option. Carrick, despite doing the big thing and putting his hands up for his error, should be the one getting the critical headlines today, not de Gea. A quick tip of the hat to Patrice Evra in particular. With six assists for the season now after his flying header set up Rooney, he now has more assists (6) and goals (4) combined than any of our midfielders. Arguably he is our most important attacking outlet and has made crucial contributions already this season. Whilst the goalscoring plaudits have gone to van Persie, Rooney and Hernandez are well on the way to getting 20 goals too. Rooney, who has more assists than any other player in the squad (10) took his goalscoring total to 12 for the season – it’s as important that he starts to contribute goals again as van Persie as we’ve seen him go on runs of getting eight or nine very quickly. If there was a concern, it would be that no midfielder seems likely to reach 10 goals with Cleverley leading the way on a lowly four. Similarly, Young, Valencia and Anderson lead the way on assists with just five – bettered by Evra, Rooney, Hernandez and van Persie. As functional as our midfield has been this season, their output in the final third really needs to be improved. One of those games you’ll file under “forgettable”. With Rafael, Ferdinand and Cleverley all rested for the weekend, the changed side still looked strong on paper. The first half was very much United’s and they could have and should have gone in further ahead at the break. Rooney’s double ended up being enough for three points but with Kagawa hitting the post and making both incisive passes and runs, Southampton were being carved open easily at times. Pochettino, to his credit, showed that he’s not afraid to make changes and the half time double sub turned the game in his side’s favour. For all their possession and pressure though, their shooting was generally wayward and de Gea ended up having a pretty easy game in the end. That said, Boruc still managed to make a wonder save and van Persie had a goal wrongly ruled out so United were still the side who managed to produce the better chances. With other results this week going United’s way and five of the six sides directly below them dropping points, it’s been a good couple of days. The gap over City is back to seven points and it’s now a large thirteen back to Chelsea. Fulham this weekend will provide a much harder challenge than they did last week but without the injured Berbatov, their threat will hopefully be reduced and United have the chance to open up a ten point lead before City next play. It was a very testy second half. Southampton have to be commended for picking out Carrick as the crucial link in midfield and did well to close him down, isolating defense from attack. However, while our defending might have looked last ditch and desperate, this was a crucial test before we Real Madrid, that they passed. Fergie did well to make the subs that he did. Scholes may have been the ideal man for controlling the game, but he made do with the what he had. This was an unconvincing win, but a win nonetheless. Three points won. A seven point lead. Rafael, Cleverley and Rio were rested for the most part. And an important lesson learnt before Real Madrid. What is to be done if Carrick is closed down? In a world of “ifs” and “buts” – a virtual world – the score could very easily have been 3-1 or 4-1 or even 5-1.
the complete balls-up by TheWayneBoy when he was in one-on-one with the keeper. On the other side, MC16 put DDG in jeopardy which gifted Soton their goal while DDG only had one significant save to make from the free kick. Otherwise, they huffed and puffed but hardly threatened to blow the house down. Returning to the real world – three points while ManShitty only got one to create a seven-point gap with an expanded goal-difference. Maybe not easy-peasy but my glass is way more than half-full.